VANDALIA — The Vectren Dayton Air Show Presented by Kroger takes to the skies next weekend, June 20-21 at the Dayton International Airport. There will now be 11 feature attractions with a US Coast Guard Search and Rescue (SAR) demonstration just added to the flying display. Also in the show’s static display lineup is a US Air Force KC-135 and the only flying C-46 Commando transport aircraft will appear with other exciting ground displays. The Coast Guard has announced it will demonstrate a simulated rescue mission with its primary search and rescue helicopter, the Eurocopter HH-65 Dolphin. The aircraft capable of speeds up to 200 MPH has a crew of four including two pilots, a flight mechanic and swimmer. The advance twin turbine helo will show its all-weather, day-night capabilities and be on static display in Performer Pit Row when not flying. The US Coast Guard is one of the five armed forces of the United States and the only military organization within the Department of Homeland Security. It performs search and rescue, law enforcement, aids to navigation, ice breaking, ice rescue and maritime homeland security duties. Dayton’s aircraft and crew will be from Coast Guard Sector Detroit of the Ninth Coast Guard District. The US Air Force announced they will send a Boeing KC-135R Stratotanker to the show for static display. The KC-135R is used extensively by the military to extend the range of US tactical fighters and bombers worldwide by refueling them in-flight. It has four turbofan engines which power it to takeoffs at gross weights up to 322,500 pounds. Spectators will be able to go on board, tour the aircraft and talk to flight crews. The KC-135R will come to Dayton from the 121st Air Refueling Wing, Rickenbacker ANG Base, Ohio. The only Consolidated C-46 Commando left flying in the United States will be on display at this year’s show. “The Tinker Belle,” as she is affectionately called, will travel to Dayton from its home at Warriors and Warbirds in Monroe, North Carolina. The C-46 Commando became famous during World War II for its dangerous night missions over the “Hump” (as the Himalaya Mountains were nicknamed by Allied airmen), transporting desperately needed supplies to troops in China from bases in India and Burma. The C-46 was chosen for the missions because it could fly at higher altitudes and carry heavier loads (twice as much as a Douglas C-46). Powered by two Wright R-2800 18-cylinder supercharged radial engines with 2,000 horsepower each, the C-46 was the heaviest twin engine aircraft to see service in WWII. Spectators will have an opportunity to see “The Tinker Belle” and nearly forty other aircraft on static display, some playing a historic role in our nation’s history. There will also be many other displays and exhibits including a F-22 Raptor and KC-135 boom simulator. Sinclair Community College will also have a special drone display and tented flying exhibit. The list goes on meaning there will be much to do and see on the ground for young and old alike. Headlining this year’s show are the US Air Force Thunderbirds. They will be joined by the US Navy F-18 Super Hornet tactical demonstration team, US Army Golden Knights and US Coast Guard SAR demonstration. 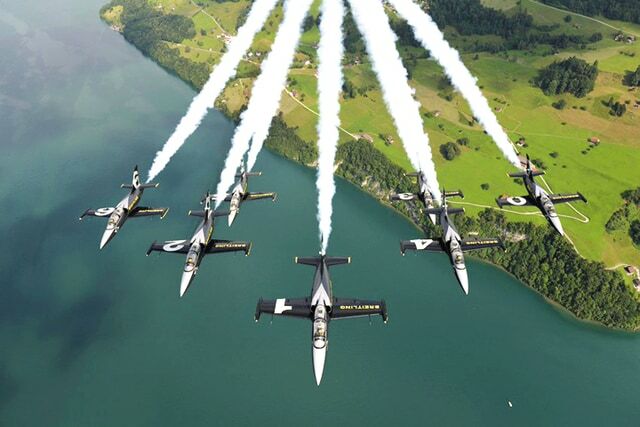 Debuting at the show this year will be the Breitling Jet Team from Dijon, France on its first North American Tour, the Jack Link’s Screamin’ Sasquatch Jet Waco and Matt Younkin’s incredible Beech 18 demonstration. Also appearing are aerobatic legend Sean D. Tucker in his Oracle Challenger and fan favorites the Shockwave Jet Truck and the Wright B Flyer. Discount General Admission tickets are now on sale at area Kroger Stores. Pavilion, Blue Sky Chalet and Chairman’s Club reserved areas along with the bargain Family Four Packs are available on-line. Spectators can get to the show with ease by taking the continuous Park & Ride Express Shuttle service provided by Greater Dayton RTA from the US Air Force Museum to the show’s main gate. Check out all show details including the shuttle and terrific ticket options by visiting the show’s web site www.daytonairshow.com.